Geek chic: This year’s biggest trend is definitely geek chic. Oversized glasses with thick black frames can help you pull of the nerd look and can make you look smarter. The main reason nerdy glasses have become so popular is because a multitude of celebrities have been sporting them. They have also become the most popular accessory among rappers and hipsters. This fall, nerdy glasses are coming in loads of different colors like neon and prints. Nerd glasses, believe it or not, look great on a wide range of face shapes because of the sturdy frame. Heart-shaped sunglasses: This fall, heart-shaped aviators have become the next-big thing in eyewear. Celebrities from Selena Gomez to Anna Sophia Robb have been sporting these lovable frames. They look great on a lot of different face shapes, but they can make round-shaped faces look rounder. Patterned frames: Before, eyeglasses were boring, personality-less things you had to use to see better. Now, they are the hottest accessory. 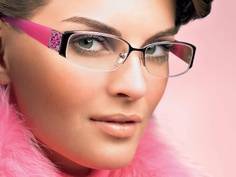 Frames that have bold patterns can brighten your face and draw attention to your lovely peepers. From polka dots to tribal print, choosing glasses with personality is definitely the best way to stand out. Cat eye glasses: Retro and cute, cat eye glasses can flatter your face by drawing attention to lovely cheekbones. They are also really popular among stars like the Kardashians and Taylor Swift. Retro glasses give your outfit a touch of sweetness while making your face look thinner. These frames work great on oval, heart-shaped, square and round faces. Colorful lenses: Brown lenses are a thing of the past since new colorful frames have hit the market. Colorful lenses have become extremely popular because, apart from looking adorable, they can make the world look less dark while adding a pop of brightness to your outfit. Fall’s newest eyewear trends are totally quirky while still being wearable. There are an abundance of different frames to choose from, so you’ll totally find a pair that suits your face shape and style.